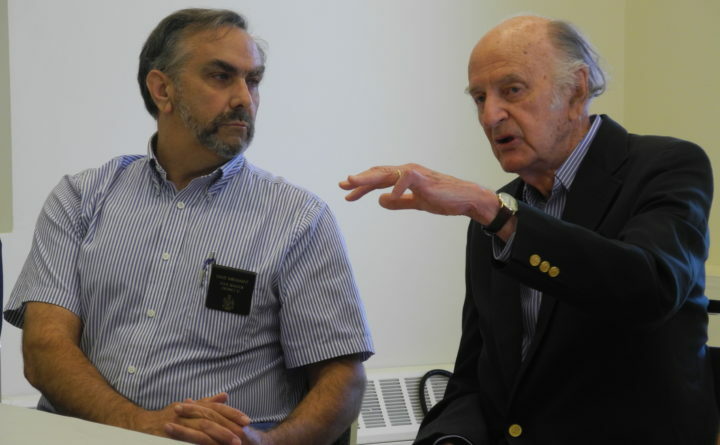 Sen. Dave Miramant (D-Camden) listens to Islesboro Selectman Arch Gillies discuss a project in this July 7, 2015, file photo. ROCKPORT, Maine — Sen. Dave Miramant, D-Camden, was the only Democratic lawmaker to testify last month against a bill that would remove non-medical exemptions that allow children who have not been vaccinated to attend Maine schools. His opposition to the bill, which won a party-line committee recommendation earlier this week, troubled some constituents. At a meeting on Friday, about a dozen of them, including several nurses and doctors, urged him to reconsider his stance. In his testimony on the bill, LD 798, Miramant said he opposes removing religious or philosophical vaccination exemptions because it removes the freedom of a parent or guardian to choose vaccination schedules they feel are safest for their children. If passed, the bill would require those parents to vaccinate their children before they are enrolled in a public school. In Maine, vaccination rates for public school children have hovered near 95 percent since 2013. However, during the past school year, only six states had a higher vaccine opt-out rate than Maine, and the share of kindergartners vaccinated for measles dropped in this school year for the third straight year with the share of students citing nonmedical exemptions rising from 5 percent to 5.6 percent. At Friday’s meeting, Miramant raised concerns about the vaccination schedule set by the Centers for Disease Control, which he argues is heavily influenced by pharmaceutical companies. He also questioned the effectiveness of vaccines and the potential for negative side effects on children. However, many of the medical professionals at the meeting pushed back against Miramant’s claims, saying they’ve been debunked by science-based research. All of the constituents who attended Friday’s meeting support the bill and took offense to Miramant’s accusation that the bill would kick children out of school. “This isn’t true. Don’t use that language. No one wants to kick kids out of school. We would like to keep preventable diseases out of our schools and away from our children. That’s what we’re trying to do,” Chris Rheault said.